Kinross was the capital town of Kinross-shire until 1975 but is now part of Perthshire. Situated on the western shores of Loch Leven (in which is Castle Island where Mary Queen of Scots was imprisoned in 1567), amidst rolling green hills, Kinross is the ideal position to base your stay in Perthshire, offering hill walking, golf, cycling and fishing. Kinross, originally the county town of Kinross-shire, is an attractive town, overlooking Loch Leven. The town is a community of about 5000 people. The area is strategically located near the M90, making it accessible from Scotland’s main cities: Glasgow, Edinburgh, Perth and Dundee. 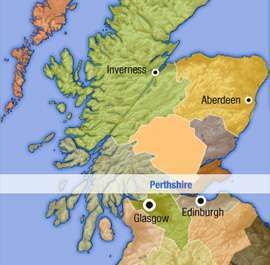 Despite its fairly small size, the county of Kinross-shire is rich in history. Loch Leven, the largest loch of the lowlands, dominates Kinross and also plays an important part in Kinross history. The loch has two islands, one of which houses the Loch Leven Castle, famous as a place where Mary Queen of Scots was imprisoned in 1567, and where she staged her dramatic escape by boat nearly a year after. The castle is open to the public between April and September, and it can be reached from Kinross by boat. Loch Leven is also home to one of the most important nature reserved, the Loch Leven National Nature Reserve. The reserve attracts thousands of migratory birds each year, including ducks, swans and geese. The area vegetation gives the place its dramatic colour and texture, especially in the autumn. Kinross is beautiful through out the year. In spring, visitors walking in the woods are treated to the birds’ chorus. Willow and hazel trees are also in bloom and the landscape comes alive with snowdrops, crocuses and daffodils. Lucky visitors may also get to see the great crested grebe’s courtship dance on the loch. April is also the time when the sand martins and the swallows return from Africa. Summer is probably the best time to visit Kinross. When the loch reflects the sun and just simply looks stunning. Kids can enjoy chasing dragonflies and damselflies that are dancing over small pools and wet ditches. Autumn is time for berries, but only pick them if you know what you are doing, because some of them are not for eating. Winter can be harsh with heavy snow falling but at milder days, you can go for a trek in the forest and see red squirrels searching for food. Kinross walks, especially the Loch Leven Heritage trail, are level and generally easily accessible making them suitable for everybody including children. Most parts of the trail are accessible to pushchairs, wheelchairs and motorised scooter. Accommodation is not difficult to find in Kinross. There are a number of Kinross hotels available, ranging from luxury to budget hotels. There are also a few self-catering accommodations in the area. Idyllically set between rolling hills, Kinross is the ideal to explore the beauty of Scotland. Rich in history - Queen Margaret of Scotland, William Wallace and Robert the Bruce are just a few of the well known figures who have visited Kinross-shire.